From Bullet Hole to Libertarian soul: Ron Paul returns to Gettysburg | The Gettysburgian. In 1954, a young man from Pittsburgh stepped off a Greyhound bus and embarked on a four-year journey at Gettysburg College that would include a stint as manager of the venerable Bullet Hole, a decision to study biology and a marriage to a young woman named Carol. In 2016, that same man, who now hails from Texas, stepped off an airplane with his wife of 59 years for a four-day whirlwind visit to Gettysburg College that included celebrating the 100th anniversary of the Lambda Chi Alpha fraternity’s presence at Gettysburg, lunch with the Eisenhower Institute’s Fielding Fellows and – the highlight -serving as the keynote speaker at the political science department’s annual Constitution Day Lecture. That man is Ron Paul, a 1957 alumnus of Gettysburg who went on to serve as a physician both in the Air Force and in private practice and then as a United States congressman for a total of 24 years with three runs for the Presidency interspersed in 1988, 2008 and 2012. Paul, a jovial octogenarian who retired from Congress in 2013, is a frequent speaker on college campuses around the country where he shares his message of liberty; something he thinks resonates with young people. His speech last Thursday drew a crowd of more than 800 people including a sizable number of non-students who traveled, in some cases, from several hours away to hear the libertarian movement’s charismatic spokesman. One Facebook event reached thousands of people before the event, spreading the word on campus and off. Paul’s speech began with an introduction from Dr. Ken Mott, professor of political science, who called Paul a “totally independent thinker” who delivered a “worrisome, challenging, and inspirational” message to the crowd. Paul discussed a non-aggression principle that has been lost in America to a mindset of the government providing for people and protecting people from themselves. He sees little difference between the Republican and Democratic parties, claiming that America essentially has a one-party system, the two major parties in conglomeration. Paul decried the influence of money and lobbyists in politics, pointing to the military industrial complex as “huge welfare” that should be eradicated. Ultimately, Paul believes that a free market system provides the best opportunity for anyone to achieve prosperity without dependence on the government. He foresees the current system of entitlements and taxation as likely to lead to a financial crisis worse than that of 2008. Anticipating various counterarguments to his message of removing government safety nets, Paul reported that Americans donated $385 billion to charity last year, which indicates that if they did not have to pay taxes, they would donate more and our system would be better off. 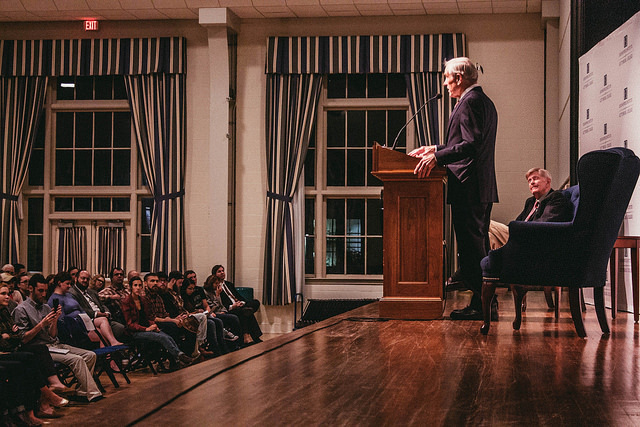 After the speech, a question and answer session began that predominantly featured questions from non-students in the audience who were disciples of Paul’s and the libertarian movement in general. Themes included steps individuals can take to promulgate the libertarian cause, the upcoming election and general Ron Paul fandom. Dan Bower, a junior at Gettysburg, appreciated Paul’s remarks. The next day, The Gettysburgian sat down with Paul to discuss the libertarian movement more broadly. Paul said that despite considerable enthusiasm from grassroots activists and other observers, he is less than enamored with the Libertarian Party’s presidential ticket, which does not espouse pure libertarian values. Paul puts considerably less stock in elections than in conversations; he could not recall an election in his lifetime that fundamentally changed America. Consequently, he focuses on talking to people about the libertarian way, and he thinks the future of the libertarian movement is bright.